Donovan Bixley re-tells the story of Maui fishing up North Island! The traditional tale but with Donovan's unique twist and trademark humour. The pictures will be bright and bring their own level of humour to the book. Darryn Joseph will ensure that the story is accurate and cult... read full description below. Donovan Bixley re-tells the story of Maui fishing up North Island! The traditional tale but with Donovan's unique twist and trademark humour. The pictures will be bright and bring their own level of humour to the book. 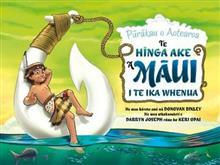 Donovan Bixley is an award-winning illustrator and book designer based in Taupo. He has illustrated over 80 books across a broad range of genres, from his best-selling preschool books The Wheels on the Bus (2010) and Old MacDonald's Farm (2011), to his wordless book about extreme climate change, The Weather Machine, his hybrid comic/novel Monkey Boy, and his illustrated biography Faithfully Mozart, which was a finalist in the 2006 Montana New Zealand Book Awards. 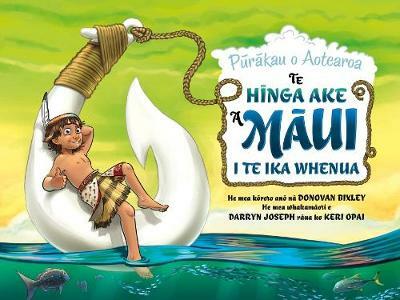 Donovan has also worked with top New Zealand authors: recreating Dashing Dog by New Zealand's world famous Margaret Mahy; illustrating two of Barry Crump's Pungapeople books, co-creating the internationally acclaimed Dinosaur Rescue series with Kyle Mewburn, and illustrating The Three Bears Sort Of by Yvonne Morrison, which won the coveted Children's Choice Award at the 2014 NZ Post Book Awards for Children and Young Adults. When he's not immersed in the world of picture books, Donovan plays guitar, piano and saxophone, and is front-man for Hot Tub, a 13 piece funk/jazz band. He has also been involved with the Taupo Theatre Company, both on stage and behind the scenes as a designer.